My CrossBreed SuperTuck made with premium horsehide holstering my Glock 23. The CrossBreed® SuperTuck® holster is an inside-the-waistband holster designed for deep concealment and comfortable carry. Despite being a rather large holster, the SuperTuck achieves these goals quite nicely. The premium cowhide or horsehide is cut to mold the holster to the shooter’s hip while allowing a full range of motion. The holster side of the leather has been smoothed and treated, presenting an attractive semi-glossy appearance. At the top, front of the leather, where the pistol grip and rear of the slide extend out, there is a nicely imprinted CrossBreed Holsters emblem personalizing the holster. The backside of the leather has been left in its roughened scraped appearance, but is as soft as microfiber. The premium cowhide or horsehide is paired with a custom-molded Kydex holster specifically designed to hold the shooter’s selected handgun. The Kydex has an open top and open bottom design to reduce the amount of hard surfaces that could jab at the shooter’s body during carry. 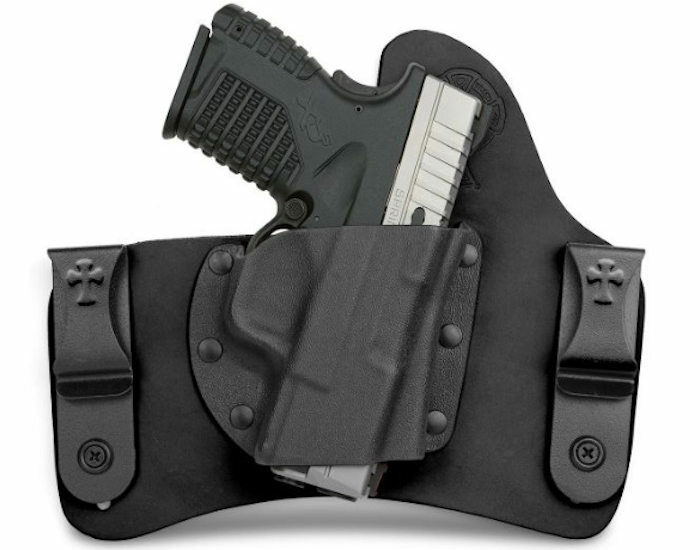 The holster position keeps the Kydex at or slightly below the shooter’s belt-line so there is a natural support and feel to the holster’s position. 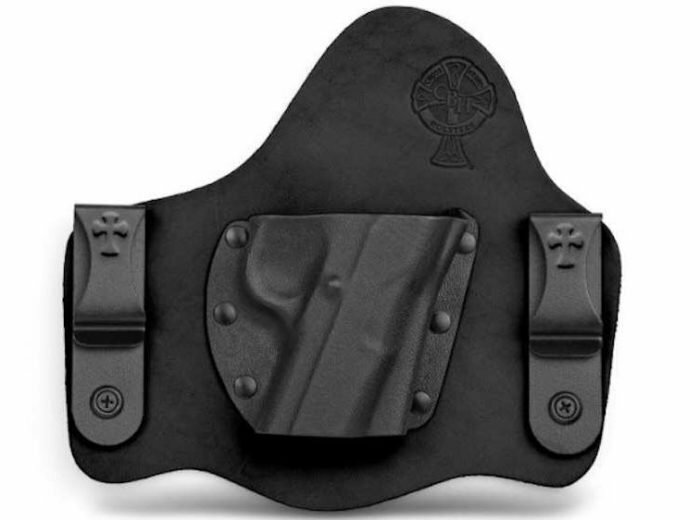 Despite the open-bottom design, CrossBreed has designed the SuperTuck holster to cover most of the shooter’s slide when carried. This design provides superior support and retention capabilities over smaller open-bottom designs. Premium horsehide leather with perfectly molded Kydex and powder-coated belt clips. CrossBreed offers a Standard and Combat cut on their leather backing. The Standard cut uses more gentle angles and provides the most leather backing around the exposed grip and rear of the slide when a pistol is holstered. The Combat cut reduces this portion of the leather with a reverse-L cut. The advantage of the Combat cut is the greater ability to get your thumb around the grip of the handgun quicker during drawing. The disadvantage of the Combat cut is more of the firearm is touching the body which can reduce comfort and introduce more sweat/fibers to the handgun while being carried. The CrossBreed SuperTuck Combat Cut accommodates a full master grip. The Kydex is securely mounted to the leather backing using (6) rivets, (3) on each side of the holster. The rivets are smooth and slightly raised on the outside of the Kydex holster, removing any snagging concerns. On the body side the rivets are smooth and flush (almost indented), making them completely unnoticeable when the holster is worn. The Kydex/leather combination presses the handgun snuggly into the holster, providing excellent tension retention at a Level I retention safety. SuperTuck holsters come with (2) SnapLok powder-coated steel belt clips, (1) on each side of the holster. This (2) belt clip arrangement provides excellent stability for the holster when carried. A great design feature of the SuperTuck is the ability to adjust the belt clips to (4) ride positions. This feature allows shooters to further customize their SuperTuck to fit their individual needs, desires, or body size. In addition, the potential to adjust just one of the belt clips allows shooters a fairly wide range of angles their pistol will ride when carried. CrossBreed personalizes their holsters with a CrossBreed stamp and raised crosses on the belt clips. The belt clips off the CrossBreed have a hyperbolic curve to reduce unnecessary material, and along with the CrossBreed raised cross, provide a very aesthetic appearance. The double belt clip design is excellent for preventing the SuperTuck from sliding out of position during heavy movement by the shooter. Finally, the superb belt clip design allows the clips themselves to separate from the leather at the top, so the shooter can clip the SuperTuck to the belt and then tuck in their shirt behind the belt clips leaving only the belt clips themselves exposed. This is truly a great advantage of the SuperTuck IWB holster. This design feature is particularly important for IWB holster wearers, who most often have selected that holster design to maintain the maximum concealment. Having your holster slide out-of-place during the critical moment is unacceptable and potentially deadly, and any movement could also expose the firearm and defeat the desire to remain concealed. According to CrossBreed, the standard SuperTuck configuration is best worn at the 3:30 to 5:00 position for right-handed shooters, or the 7:00 to 8:30 position for left-handed shooters. In other words, the SuperTuck should be worn just slightly to the rear of the shooter’s side and slightly angled back towards the kidney area for the most comfortable carry position. This allows the holster its best opportunity for concealment, the ability to conform to the shooter’s body, and still provide a fairly fast draw position. The CrossBreed SuperTuck can be tailor-made to fit everything from full-sized Model 1911’s to the compact Glock 42 or 43. The list of handguns the SuperTuck can be made to accommodate is very impressive and nearly all-inclusive of the most popular handgun models. Handguns from most of the major manufactures are covered, and even smaller manufacturers are available. Perfectly molded Kydex securely holds the selected firearm with tension retention. Wilson Combat offerings, and a few more. The CrossBreed SuperTuck conceals very well, with superior stability from the belt clips. We were first introduced to CrossBreed several years ago at SHOT Show. They were in one of the smaller booths, but had a very friendly staff and some amazing holsters. At the time Kydex holsters were already abundant on the market, so we were unsure if this small company would stand out and survive. However, after a brief examination of their holsters, including their flagship SuperTuck, we were very impressed with quality, materials, and cost. The lifetime warranty is another amazing testament to the CrossBreed mission. The SuperTuck we obtained was designed for a Glock 22/23, my standard duty and off-duty handguns. We selected the premium horsehide with its tan color. The tan color tends to blend better with skin (caucasian) and clothes, and provides variety from the standard black holsters flooding the market today. The tension retention of the CrossBreed SuperTuck is outstanding. Initial examination of the SuperTuck was very satisfying. The fit and craftsmanship were top-notch, the Kydex was perfectly molded to fit my Glock pistols. The Level I retention was more than adequate and confident. When inserting my Glock into the SuperTuck there is a slight click as the handgun reaches is final resting position. Retention is strong enough that when the holster is inverted the Glock remained in the holster without moving. Despite the strong tension retention from the SuperTuck Kydex, drawing my Glocks was very natural and required minimal effort. Securing the SuperTuck into position may require some test and trial for new owners, and pivots on the shooter’s preference of securing the holster onto the belt before or after donning your pants. Though either method can be successfully performed, we found that mounting the SuperTuck into position on the pants/belt prior to donning pants was the easiest method. In addition, the SuperTuck is a little larger than some IWB holsters, especially ones with only one belt clip. As such, finding the perfect carry position on the shooter’s side may take some time adjusting until that perfect fit is obtained. We also recommend shooter’s use a belt while wearing the SuperTuck for a much more secure fit. Simply clipping the SuperTuck onto pants can be done, but is not nearly as secure. CrossBreed SuperTuck belt clips pull forward allowing the best concealment behind a tucked shirt. The CrossBreed SuperTuck leaves the handgun grip fully exposed, allowing the shooter to obtain a good grip during the draw. With the SuperTuck IWB holster fitting tightly against the shooter’s body, the shooter will need to place their thumb flat against the back side of the slide while curling their fingers around the grip for the draw. This is actually a recommended grip technique for securing a Glock into a holster to help prevent the pistol from going out of battery in the event the slide strikes the edge of the holster. As the handgun becomes free of the holster, the shooting hand thumb can quickly and naturally slide down and into position for a master grip. Returning the handgun to the SuperTuck simply requires reversing the motion. Wearing the SuperTuck really highlights the outstanding design. The premium leather is soft, and conforms to the shooter’s body. With the Kydex holster and steel belt clips on the outside, the shooter simply feels the soft, brushed leather against their body. The addition of the holster and sidearm inside the pants does broaden your girth, so if your belt is already a little tight you may have to consider getting the next size up. After no time at all the CrossBreed SuperTuck seems to blend in with your clothing and it is quite easy to forget that your carrying a concealed firearm at all. The CrossBreed SuperTuck has a brushed soft leather backing for maximum comfort. CrossBreed Holsters has obtained an outstanding reputation for quality holsters in the short decade-plus they have been in business. The SuperTuck has a 5.0 out of 5.0 rating with over 160 reviews on their website. We found the SuperTuck to be an excellent selection for an IWB holster. The SuperTuck provides great friction retention for secure handgun carry, with the Kydex molded perfectly for the selected handgun. The double belt clip design may make the SuperTuck a little larger than other IWB holsters, but its secure positioning during carry is a strong feature and one we greatly appreciated. The premium leather backing is both attractive and extremely soft against the body. Personalized CrossBreed symbols on the leather and belt clips makes an attractive overall product. We highly recommend the CrossBreed SuperTuck for on-duty or off-duty IWB handgun carry. The CrossBreed SuperTuck accommodates full-size to compact pistols like this XDs.